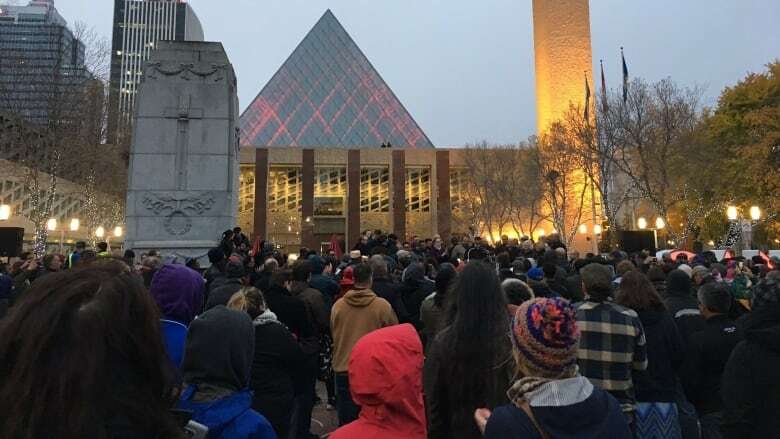 With police providing security, a crowd of 300 Edmontonians huddled together in Churchill Square on Sunday evening at a vigil for victims of Saturday night's suspected terror attacks. Edmonton Mayor Don Iveson, Alberta Premier Rachel Notley, Education Minister Dave Eggen and federal Infrastructure Minister Amarjeet Sohi were among those bundled up in the cold and wet Edmonton weather. Streets were closed around the square and police observed from several positions, including the roof of nearby Edmonton City Hall. "We stand together," Iveson told the crowd. "All faiths, all cultures. We will not be divided." Urging people to reject hate and division, he said Edmontonians "have shown what we are made of" in the hours since a pair attacks Saturday evening left five people injured. Police have a suspect in custody and terrorism charges are pending. Near Commonwealth Stadium where the Edmonton Eskimos were playing, Edmonton police Const. Mike Chernyk was struck by a Chevrolet Malibu and then stabbed by a man who fled the scene on foot. Hours later the same man, driving a rented U-Haul truck, struck and injured four pedestrians in the busy downtown, police said. Chernyk, 48, and two pedestrians who were hit have been released from hospital. Two victims remained in hospital Sunday. The vigil was organized by the Alberta Muslim Public Affairs Council as a way for people to show they stand together against violence in solidarity with Edmonton police. "For those who want to strike fear into our hearts and strike terror into the heart of the city — you will have to get past Alberta's Muslim community first and foremost," Aurangzeb Qureshi, AMPAC's vice-president of communications, said to applause. Habiba Abdulle, from the Alberta Somali Community Centre, said she came to the rally to stand with fellow Edmontonians. "(To) show a strong solidarity with each other because of the tragic events and acts of terrorism. We believe that's what the terrorists want. They want us to be divided and to make our city a miserable place and a divisive city," she said. Notley said the community reaction to Saturday's events show that Alberta is a province of people "who drop everything to help others in a crisis, people who devote their lives to keeping us all safe, and people who come to stand together to say we will not give in to fear. "We will not give in to hate, we will not give in to discrimination and we will not give in to terrorism," Notley told the crowd. Many in the crowd saved their loudest cheers for members of the Edmonton Police Service. From the podium, Insp. Trent Forsberg said the outreach of support from the city's Muslim and Somali communities has meant a lot to police. "We stand more solidly than we ever have," Forsberg said. Sogand Zakerhaghighi and Fatema Ali attended the vigil to show support for their fellow Muslims and demonstrate against a hateful act they say doesn't define their faith. "When somebody that preaches my faith does something like that, I think it's a moral responsibility to come out and speak against it," Zakerhaghighi said after the vigil. "And I feel like there's no better way to do that than this." "We can stand together no matter what gender, what religion, what sexual orientation," Ali said. "We do stand together, united we stand."